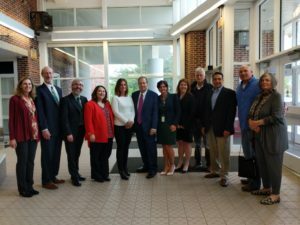 Last year, Lou Mandarini Jr., business agent for the Laborers Union and secretary treasurer of the AFL-CIO, and I started to talk about whether there was a way to partner to create more opportunity for Gloucester High School vocational students. Our issue on Cape Ann: hundreds of students from Gloucester apply annually to Essex North Shore Agricultural and Technical High School – more than can be accepted. Other students are wary of leaving their friends behind to go to a new school or can’t find the right fit in Gloucester High School’s vocational program. On the union’s side: hundreds of jobs on worksites around the North Shore and Boston are vacant – despite the pay and benefits – because of a lack of skilled tradespeople. Lou and I followed up our meeting with Heidi Riccio, superintendent of Essex North Shore Agricultural and Technical High School. We met with Mayor Sefatia Romeo Theken, State Senator Bruce Tarr, School Committee Chair Jonathan Pope and Vice Chair Kathy Clancy, Gloucester and Essex North Shore School Committee member Melissa Teixeira Prince, Superintendent Richard Safier, and Principal James Cook. All parties involved agreed that we would do what was best for our students. From these talks, our team put together a cutting-edge pilot program that will provide new opportunities to students in Gloucester who want to enter the trades. We had one last hurdle to overcome: students needed transportation to Essex North Shore. Although Senator Tarr and I committed to secure state funding, the development of the program came together much sooner than our opportunity to acquire state funds. That’s where John and Mollie Byrnes stepped in. Longtime supporters of both traditional and vocational education, they generously contributed the cost of transportation. Students in the program, starting in their junior year, will complete their academic coursework at GHS in the morning. They will then spend four afternoons of the week at Essex North Shore and one afternoon at GHS learning a brand new vocational curriculum directly from Laborers’ and GHS instructors. After the completion of this 18-month program, students will graduate from high school credited with half of their four-year union apprenticeship requirements and all the commensurate pay and benefits. Creating new employment opportunities for Cape Ann residents is one of my top priorities. Gloucester Marine Genomics Institute is another project I have had the privilege of being involved in from the beginning. Now in its third year of providing new opportunities for students at the Gloucester Biotechnology Academy, GMGI is nearing the grand opening of a new science center on our waterfront which I had the opportunity to tour this week. Together, we worked diligently to obtain a $2.7 million grant from the Massachusetts Life Science Center to pay for the construction and outfitting of the new facility. In addition, we obtained a $300,000 grant for middle and high school biotechnology programs. I’m proud to have been a part of the development of new opportunity for our vocational students and I will continue to be committed to working to find innovative new ways to give opportunities to residents of Cape Ann.